January 18, 2016 By This post may contain affiliate links. 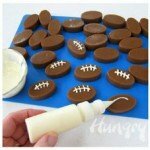 Sweeten up your Super Bowl party by making a batch of Microwave Caramel Footballs decorated with white chocolate laces. 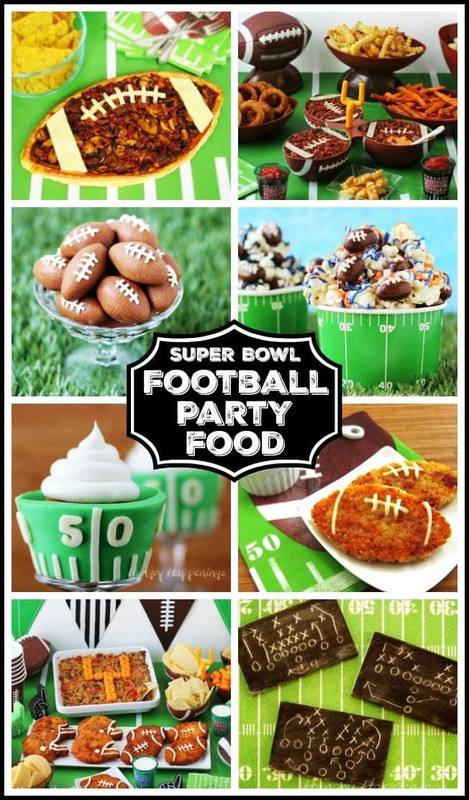 This caramel recipe is so easy to make that you will quickly create enough for an entire football team. If you’ve ever struggled to make homemade caramels, you’ll love making this easy microwave caramel recipe. 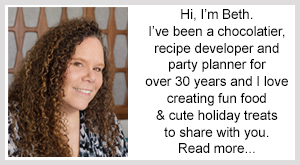 For years at the holidays, my friends and I would gather together to make big batches of homemade caramels. We’d spend hours standing over a hot pot of liquid gold, stirring, and stirring and stirring some more. It was exhausting, but I loved the caramels and thought I had to put in that effort to make the candies my friends and family loved so much. That was, until I found that the exact same ingredients could be used to make caramels in the microwave that taste exactly the same and require less than a minute of stirring. Best of all, the caramels I’ve made in the microwave have never crystalized. 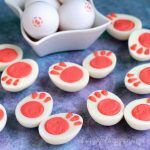 This caramel can be poured into a pan then cut into squares, but you can also use it to create caramels in any shape and size like these oval footballs. 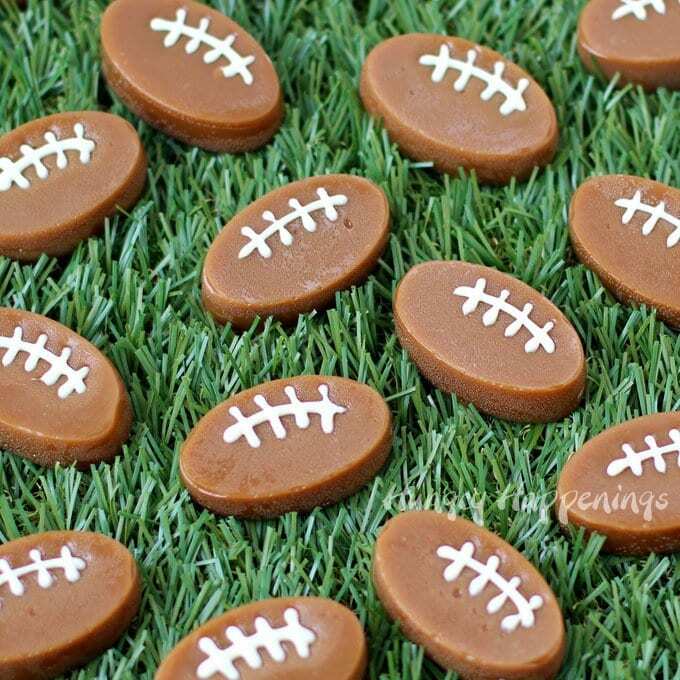 To turn oval caramels into footballs all you have to do is pipe on some white chocolate laces. To make the caramels, start by melting butter in a large microwave safe bowl. Then stir in brown sugar, corn syrup, and sweetened condensed milk. Heat in the microwave on high for 5 minutes. Remove the bowl and whisk until well blended. Heat for 5 more minutes, then remove and stir. Heat another 5 minutes and stir. Now, some recipes will tell you the caramel is ready at this point, but all microwaves are different, so I suggest testing the caramel to make sure it’s ready. You need the caramel to be firm enough to hold it’s shape, so it should reach 245-250 degrees Fahrenheit. 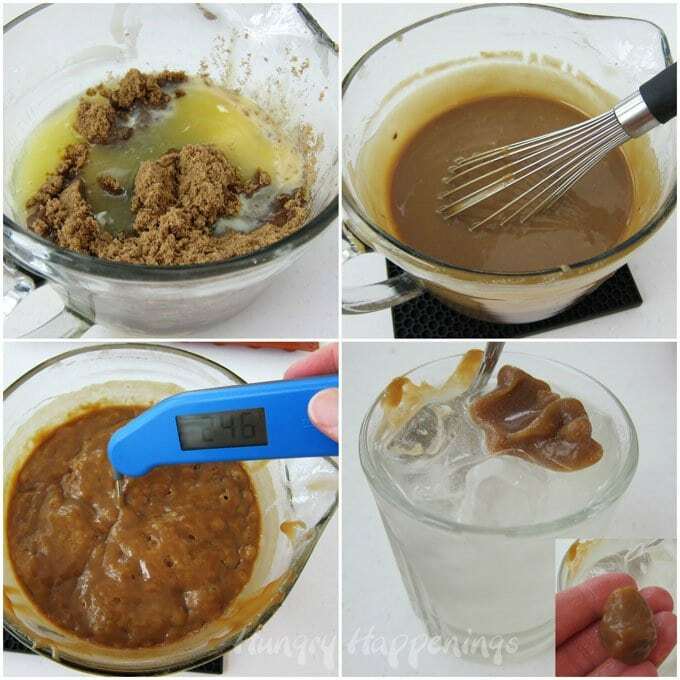 You can test it with a thermometer, like the Thermapen Instant Read Thermometer I use, or you can fill a glass with ice water, pour in a spoonful of caramel, and see if it’s firm enough to roll into a ball and hold’s it’s shape. If it’s not hot enough or firm enough, then microwave it for one minute increments, testing after each. When it’s ready, stir in the vanilla extract. I forgot it when I made this batch, and the caramel still tasted great. Pour the caramel into silicone molds, filling each oval cavity to the top, scraping off any excess using an offset metal spatula. DO NOT TOUCH THE CARAMEL. It will burn. I poured my caramel into 2 molds, each with 16 small oval cavities, but had left over caramel. 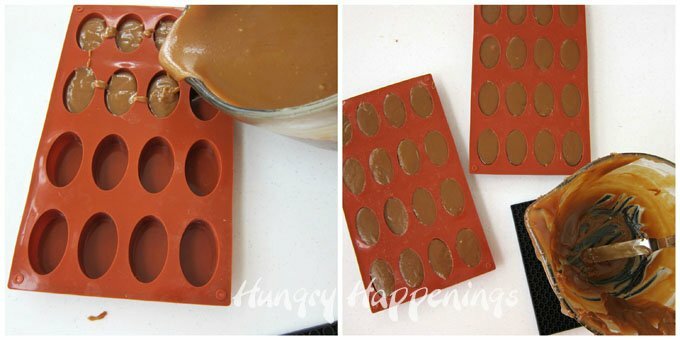 You will have enough caramel to fill about 42 ovals, so you’ll need 3 silicone molds to use up all the caramel. I just poured the rest onto a silicone mat and allowed it to harden, then cut it into small pieces. Allow the caramels to harden for about 2 hours then unmold them by pressing on the back side of the mold allowing the candies to fall out. 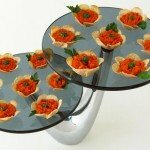 Set them on a non-stick silicone mat or a baking sheet lined with non-stick tin foil or wax paper. 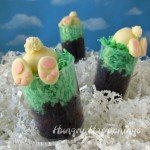 To decorate, pour melted and tempered white chocolate or melted white confectionery coating into a squeeze-it bottle, pastry bag, or zip top bag and pipe on laces. Allow the white chocolate to harden, then the caramel footballs are ready to serve. 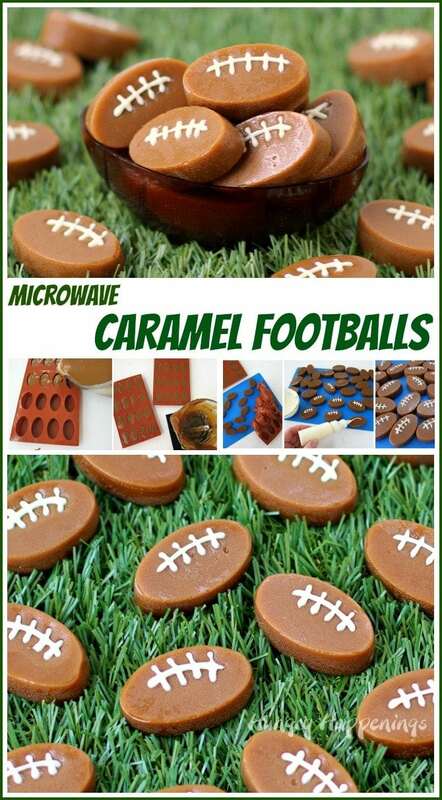 Football shaped caramels made in the microwave make the perfect Super Bowl snack. Melt butter in a large microwave safe bowl on high power for 45-75 seconds. Stir in dark brown sugar, corn syrup and sweetened condensed milk. Heat on high power for 5 minutes. Heat for 5 more minutes, then stir. Heat for an additional 5 minutes, then stir. 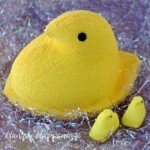 Check temperature, if it's between 245 - 250 degrees F, pour it into the oval shaped molds. If needed, heat for 1 minute increments, stirring after each until desired temperature. Let caramels harden for 2 hours. Un-mold and set on a silicone mat. Pipe white chocolate laces over each football. 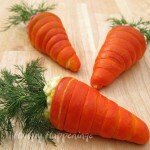 You’ve got to give them a try, they are super easy and taste amazing. Can I ask what wattage your microwave is? 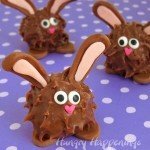 I’ve tried microwave caramels before and burnt them because my wattage was higher. Thank you! I just checked my microwave and it’s listed at Input 1500W and Output at 1000W. I think that’s lower than the one we had prior to this. I would suggest watching it closely on the third time in the microwave and maybe remove it sooner to check the temperature.